Incredibly realistic trees using primarily our exclusive True Needle™ award-winning foliage to accurately mimic the colour, texture and structure of real evergreen needles. There are many different reasons that people choose to adorn their homes with our lovely artificial Christmas trees - from the beauty and convenience of having the exact same tree every year, to practical reasons like allergies to live trees or the mess that falling needles make. But one thing that many shoppers have in common is that they are looking for the most realistic Christmas trees out there! 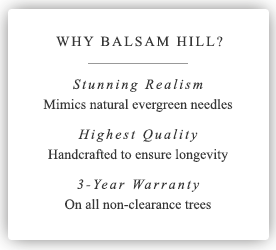 Balsam Hill’s selection offers multiple levels of realism to choose from including our traditional style of Christmas trees that feature a nostalgic style of branch and a realistic option that uses a combination of traditional and modern branches. But our most realistic artificial Christmas trees are made using our award-winning True Needle™ technology. This proprietary manufacturing technique allows us to create artificial trees that are virtually indistinguishable from natural Christmas trees. The secret to the stunning realism of the branches lies in our molding process, where we take casts of real natural branches to perfectly copy them down to the needle. From that cast, we construct our injection molds. These are then filled with polyurethane which is dyed with various pigments to recreate the stunning color, texture, and structure of real evergreen needles. Our most realistic artificial Christmas trees also offer the unique feature of color variation not only on each individual needle, but across the branches. If you look closely, you will notice that the central branch is as brown as nature intended, while the needles feature a beautiful green gradient. Each lush tree branch on every one of our most realistic trees is carefully constructed in this way. With this striking attention to detail, you never have to choose between a tree that brings the warmth of nature into your home and one that is easy to take care of.